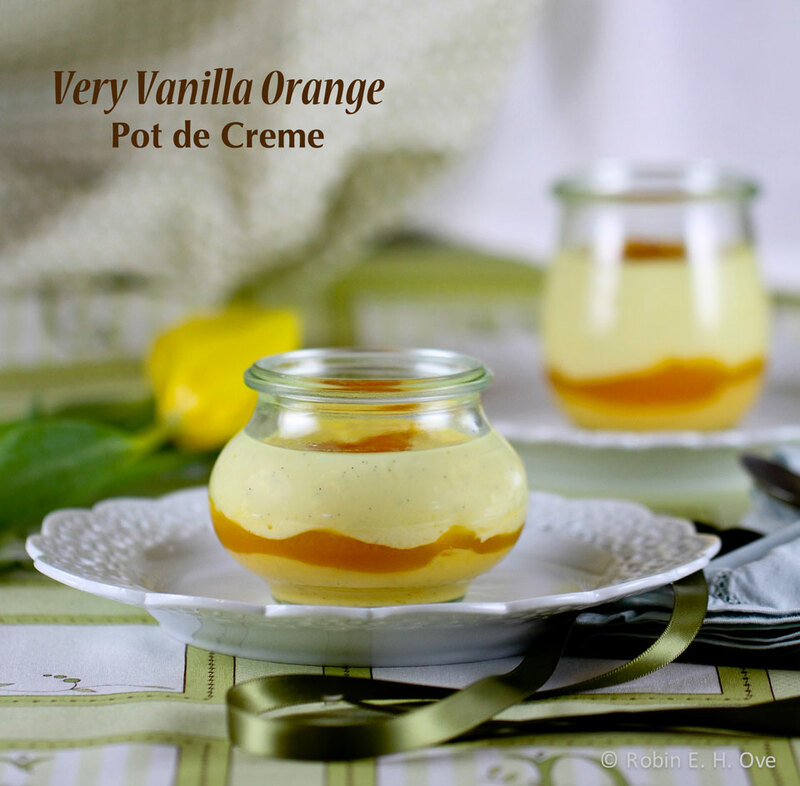 Creamsicle Inspired Pot de Crème - What about the food? It was something someone said, or posted that led me here. A trusted source with impeccable taste giving a passing mention, a link, a comment. Funny how such things stick in my head, rattling around for weeks until I must succumb to another monthly themed cookery challenge or invitation. Thanks to Jamie, my dessert scout from Life’s a feast I landed on Abby Dodge’s site and her BakeTogether activity for February, Very Vanilla Pot de Creme. 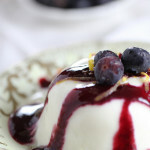 A seemingly simple custard dessert and a wink and a challenge to make it my own. How can I resist such a thing? Springtime is beckoning, early blossoms of tulips, daffodils are emerging and this is the time of year when we are lucky to enjoy the winter citrus harvest. With an abundance of variety fresh off the trees and flavors at their peak, our choices are many. 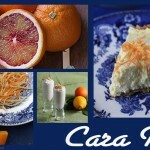 On hand I had Cara Cara Navel oranges and Satsuma Mandarins. The juices married nicely with a bit of honey and the vanilla with a drop of almond extract rounding the flavor profile. The mere act of juicing filled the house with bright, crisp aromas. I know I will be influenced by this for several weeks. It has been a very long time since I made a custard, rich in egg yolks and vanilla and then it is usually for ice cream. Seems a little decadent to me five yolks for four dessert servings and then I am left with the whites forcing my brain to think of a inspired part two not wanting to waste a single bit. As the creative options swirled in my head I kept coming back to vanilla and orange, reminiscent of those Dreamsicles or 50/50 Popsicles eaten on warm summer days. The result a layered pot de créme, looking like one of those sand paintings in jars we did as kiddie art projects. 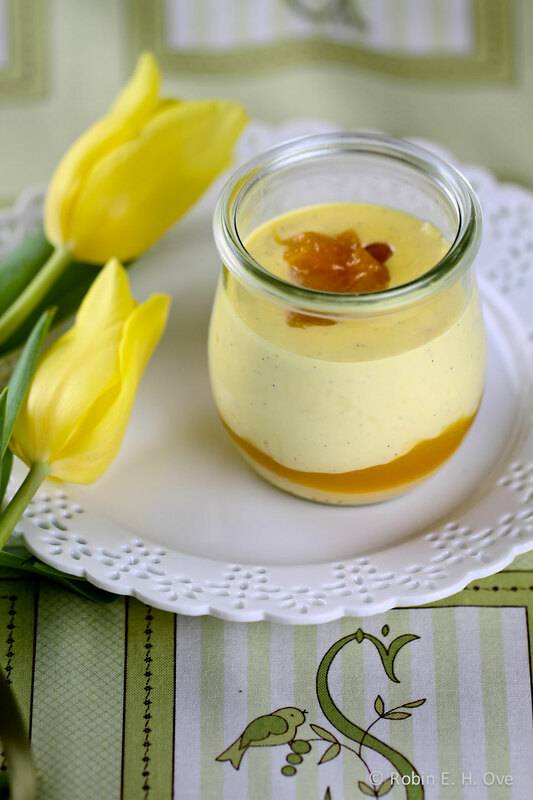 When dipping in this little pot, your spoon combines a smooth rapidly melting glacé of orange as the lustrous, silken warmth of the very, very vanilla custard finishes. The two layers mixing together on your tongue. At the very bottom, the last of the creamsicle bite, harmonious, fifty-fifty. Abby’s vanilla custard recipe was very easy to follow and the results were indeed creamy and heady with the warm tropical vanilla bean flavors. Seeping the half and half with the full bean makes a huge difference in the flavor profile. It is not the same as a spoon of extract and worth the splurge. There is still time left for your entry at Abby’s. What would you come up with? 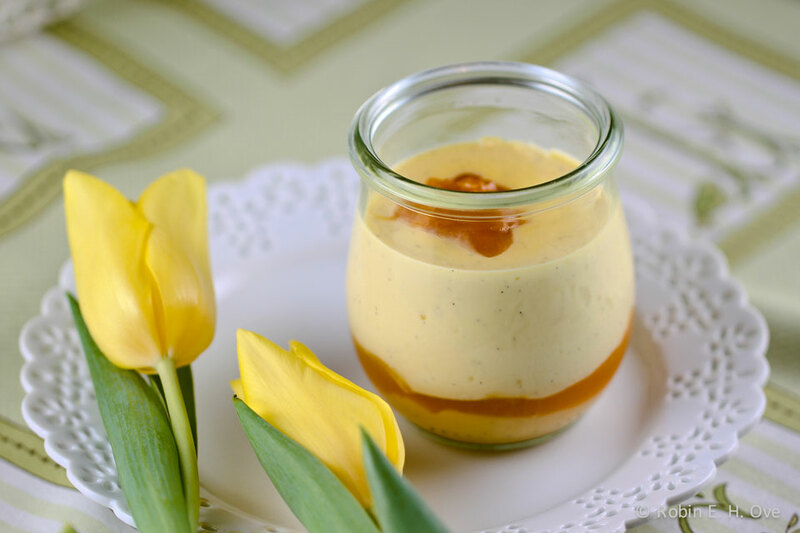 A #BakeTogether entry for Abby Dodge's Very Vanilla Pot de Creme theme. A classic combination of vanilla and orange in a ramakin. Split vanilla bean in half and scrape seeds into microwavable measuring cup. Add the whole bean and the half and half, microwave on high for 3 minutes. Cover with plastic wrap and steep for at least 30 minutes. Meanwhile separate your egg yolks from whites. Juice your citrus fruit so that you have 2 cups. Strain pulp using a fine mesh seive. In a double boiler (water not touching top pot and only simmering not boiling, medium heat) whisk the egg yolks with the sugar and salt until lightly colored and all ingredients well incorporated. Slowly pour in half and half mixture (including bean pieces and seeds) continuing to whisk and result is well blended. Continue cooking for 4-5 minutes stirring constantly until the mixture thickens and well coats the back of your spoon. This should not be runny. Remove from heat and strain through fine mesh sieve to remove any egg curdles and the vanilla bean. Slide the vanilla bean between your fingers to retain any remaining custard. This is the good stuff! 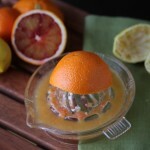 Pour the citrus juices, honey, and sugar in a small saucepan and cook over medium heat until nearly reduced by half. Add cornstarch and cook until it is thickened, but still pourable. It will continue to thicken as it cools. Add the extracts and taste to make sure it suits your sweet-o-meter. Add more to taste. 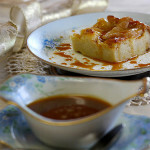 Mix ½ cup of orange mixture with ½ cup of custard, stir until thoroughly blended. Save the rest of the orange mixture for the bottom and top layers of the finished dessert. Layer your three puddings like a creamsicle. Pour the pure orange sauce in the bottom of your container, then the orange/vanilla mixture, vanilla custard and finish with the orange sauce on top. Tip: if the orange sauce gets too thick while cooling, add a bit of juice or water to thin. I learned this by the time I was finishing the top layer. If the consistency of the orange sauce is too thick it will be heavy and sink into the vanilla custard. Add hot water to the baking dish so it comes halfway up your custard pots. Cover loosely with foil and bake for 35 - 45 minutes. Mine only took 35 but your oven may vary. The custard should be “jiggly” and will continue to set as it cools. Overcooking will cause the custard to become rubbery. Remove from oven, cool on baking rack and then cover with plastic and chill at least 4 hours before serving. Abby says you can do this ahead for up to 2 days. I couldn’t wait that long. Next time I think I will add the final orange layer after the custard has cooked and cooled to room temperature before chilling. Wow! Now I want to make the same flavored pots de crème! Gorgeous! And I’ve been dreaming of orange. 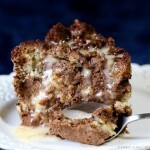 Absolutely beautiful and I’ll bet the flavor is divine! I am so happy I led you to the Bake Together. And now you have inspired me! What goes around comes around eh? What fun Jamie! Hi Amanda, I am intrigued now with what you were thinking! Thanks for the visit! Where can I purchase the glass containers pictured with this recipe? I only have boring-looking ramekins and really like yours a lot more! Can’t seem to find them on Google! Thanks for any info.